CAOS runs the secretariat of Europengineers, a close network of leading European consulting engineering companies. As the secretariat, we organise the annual general assembly and other board meetings throughout the year. We manage all communication between the members and third parties and take care of all the finances. Furthermore, we create and organize theme meetings, working groups and special forums for young professionals. In the past, among other activities, CAOS has arranged for managers to meet and discuss efficiency and sustainability. Technicians discussed airports and waste management and data specialists discussed how to collect, validate and share big data. For the young professionals of Europengineers we organized field trips. For instance, they visited the 2012 Olympics site in London, the new motor-tunnel and surrounding re-urbanisation in Madrid and the new harbour development in Hamburg. A recent project we are very proud of, was our collaboration with Bridges to Prosperity. In November 2018, 10 enthusiastic Young Europengineers members, traveled to Rwanda to build a Bridge for the Gatare community. Despite the cultural and language differences, the Europengineers team worked together closely with the local community and learned a lot from the Rwanda way of life. In less then two weeks time, they completed their work. 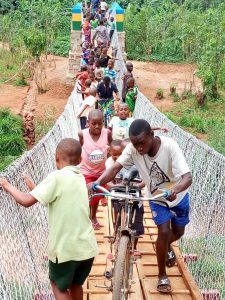 By constructing the bridge, they provided the community an easy and safe access to schools, the market and health clinics, even in the rain season!